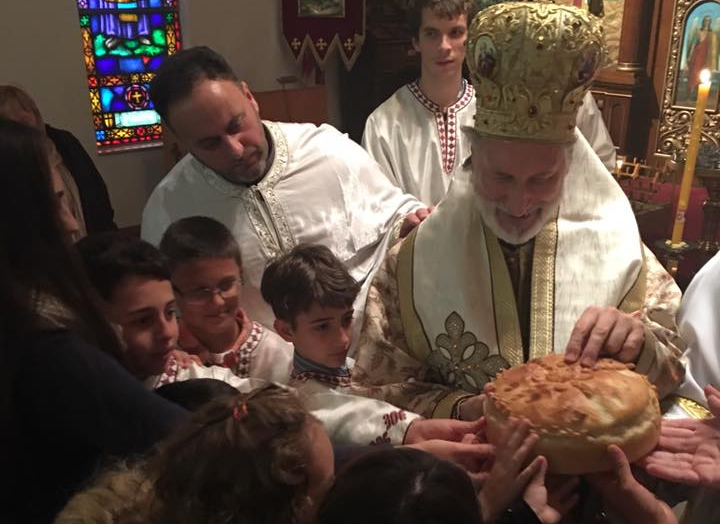 Columbus, OH - On Sunday November 20, 2016 Serbian Orthodox Church in Columbus Ohio celebrated its Church Sava – St. Stefan of Decani. His Grace Bishop Irinej was greeted and welcomed by the clergy and children carrying flowers as He arrived in front of the Church. The parish priest Fr. Isak and deacon Zeljko Jurisic along with many Altar Servers assisted His Grace serving the Hierarchical Divine Liturgy. During the Divine Liturgy His Grace delivered a very inspiring homily. His homily was based on our Lord’s Gospel story of Lazarus and the rich man. His Grace said that God is like light and fire. He is like the light that illuminates all darkness from our lives and the fire that gives us warmth of the Fathers home. God is Love and He loves all man and will embrace all of us regardless if we are sinners or not. The difference is that those that their whole life wanted to live without God will feel that embrace as punishment. So, that light instead of the illumination will blind them and the fire instead of warmth will burn them. God does not condemn anyone to hell; every day of our life we make that choice whether we want to be with God or not. The Slava Kolac and Zito were blessed at the end of the Divine Liturgy. This year Slava Kumovi were Nenad and Novka Malic with their children Milomir and Dragana. Fallowing the blessing of the Kolac and Zito, Slava luncheon was served in the social hall. All the food was prepared and donated by the Slava kumovi; Nenad and Novka Malic. During the Slava luncheon Fr. Isak, David Kos (Church board president) and Kumovi greeted and welcomed His Grace our new bishop Irinej and everyone that attended. His Grace Bishop Irinej spoke about His time in Belgrade assisting our beloved Patriarch Pavle. His Grace said that Patriarch Pavle had a great sense of humor. Once there was a team of basketball players standing in the Church behind of His Holiness Patriarh Pavle who was a short man, but a giant in every other way. Patriarh Pavle seeing the basketball players standing behind him said: “I hope I am not blocking anyone.” This story of His Grace Bishop Irinej brought smiles to all that attended that day. As there were many little children in Church that day; His Grace Bishop Irinej also said; that many times He had to criticize parents for disciplining their children for not been quiet and still during the services. He said that the reason children feel so free and at home in Church is because they know that the Church is their Heavenly Father’s House. He advised parents to let the children be children for to them belongs the Kingdom of Haven. At the conclusion of the Slava luncheon the part of the Kolac was exchanged between this year Kumovi and the next year Kumovi. Nikola (former Crvena Zvezda basketball player) and Iva Jestratijevic (former miss of Yugoslavija) volunteered to be the next year Kumovi for St. Stefan’s Church Slava celebration.